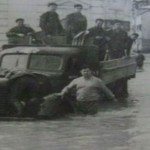 In 1970 Romania suffered serious disruption when an unfortunate combination of circumstances combined to create a great flood in late spring. High winds and storms produced prolonged torrential rain, while unseasonable warmth caused massive snow melt in the Carpathian Mountains, further overloading Romania’s river system. Resultant floods moved inexorably from the north down through the central regions to the low-lying Danube area. The mighty River Danube itself rose 2 m (6 ft) above its normal level, causing a destructive surge to travel downstream. Floodwaters overwhelmed extensive dykes that carried irrigation water needed to improve the country’s backward agriculture. The consequences were disastrous, with nearly 250 towns and villages inundated in the first few days and almost the entire country affected to greater or lesser extent. The waters did not recede for over a month and before doing so around 200 people died, more than 40,000 houses had been swept away or damaged beyond repair, tens of thousands of farm animals were drowned and crops on hectares (1,000,000 acres) of land were ruined. In addition, 250,000 people were rendered homeless and a similar number had to be evacuated ahead of the rising waters. Virtually all Romania’s factories were brought to a standstill through power failure, flooding or inability to acquire raw materials as the country’s infrastructure collapsed. Airports were closed, the railway network became paralyzed, roads were impassable as landslides blocked many that were not already under water. Problems were compounded as communications were further disrupted by widespread loss of telephone lines. Many countries contributed to the relief effort, but Romania was the one country in the Eastern Bloc to operate an independent foreign policy, and China seized the chance to tweak the Soviet Union’s nose by becoming the biggest short- and long-term donor. Death toll: 209 people died. You should know: Times move on and warning systems have become more sophisticated, so the great European floods of 2006 took no Romanian lives. But in terms of damage done and people displaced, it actually hit the country harder than the 1970 flooding.